Children who hold their pencil or pen in the ideal handwriting position, the dynamic tripod grip, can write comfortably for longer. The National Handwriting Association's Catherine Elsey explains how to help your child establish a confident tripod grip and how it helps avoid hand pain. Advice and tips to help establish the dynamic tripod grip (or grasp), the ideal hand position for handwriting as outlined by Occupational Paediatric Therapist Catherine Elsey from the National Handwriting Association. Although handwriting may seem to be a dying art in our digital age, it's still an important skill for every child to master. As your child progresses through primary school, the amount of written work they're expected to produce - both in class and at home - will increase, and being able to write quickly, legibly and comfortably for long periods of time is essential to prevent them being left behind. Many people have unusual ways of holding their pencil that don't interfere with the way they write, but the dynamic tripod pencil grasp is considered to be the best starting point for neat, effortless handwriting, so helping your child to master it from a young age will give them an advantage in later years. The diagram below shows how to help your child to get to grips with the dynamic tripod grasp. Pinch the pencil (not too hard!) between the thumb and forefinger, at the point where the painted shaft begins. 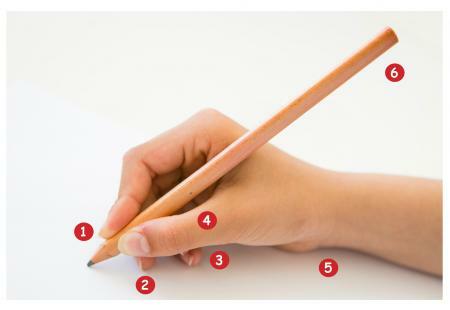 Rest the middle finger behind the shaft of the pencil: it acts like a shelf for the pencil to rest on. The ring finger and little finger should curl into the palm of the hand. The space formed by the thumb and forefinger (the thumb web space) should be round and open. The wrist should be resting on the paper, and below the writing line. The blunt end of the pencil should point towards your child's body – not forwards, sideways or straight up. Check out our quick trick to help your child ensure they get the dynamic tripod grasp right every time.